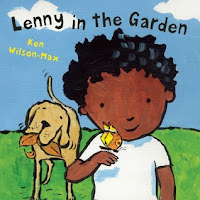 Book: Lenny in the Garden by Ken Wilson-Max (Frances Lincoln Children's Books, 2010). This sweet British import has simple text to introduce a variety of bugs that Lenny finds in his garden. This was a good basic introduction to some of the bugs we'd see throughout our storytime. 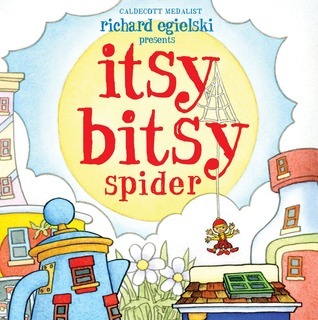 One thing to note is that the book uses the British word "ladybird" instead of the American "ladybug". Depending on the age of your kids, you can either just substitute the more familiar word or you might explain why the book uses a different word from the one American kids typically hear. Felt Rhyme: Five Little Ladybugs. I used our felt ladybugs with a flannel mitt that fits over one hand. As we said the rhyme and I removed ladybugs, we practiced counting. 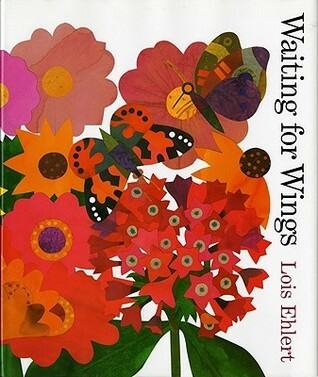 Book: Waiting for Wings by Lois Ehlert (HMH, 2001). This is one of my favorite books to share about bugs or spring or flowers! Simple, rhyming text takes you through the life cycle of a butterfly from eggs on a plant to caterpillars to chrysalis to new butterflies. The bright illustrations and varied sizes of the pages hold a group's interest very well, even young children. The pages you turn start out very small and then get bigger as the eggs hatch, caterpillars grow, and new butterflies fly in search of nectar. This is a great book to insert some STEM knowledge with the life cycle of a butterfly. It also shows how a chrysalis looks different as the butterfly inside changes and grows. We flipped back and forth between the two illustrations and talked about what was the same and different. After our rhyme, I called the scarves up to me by color (check out my post on the ASLC Blog for more about using scarves in storytime). Book: The Itsy Bitsy Spider by Richard Egielski (Atheneum, 2012). This pop-up book is a fun book for storytime and it's a book that can be sung. Singing with children helps them hear that words are made up of smaller sounds. I love to use pop-up books in storytime because they really capture the interest of the children. As I sang the words, I invited the kids and teachers to sing with me and do the motions that go with this song. 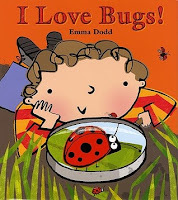 Book: I Love Bugs! by Emma Dodd (Holiday House, 2010). This is another great book to share because the large trim size and colorful pictures capture the attention of a group and this book uses lots of really great vocabulary words. Though it doesn't actually name bugs, it uses descriptive words for the myriad types of bugs that this child loves: springy, slimy, spiny, fuzzy, whiny, frilly... this book is full of great words! One reason it's great to read books with children is that books expose kids to lots of different vocabulary words that they might not hear in typical conversation. It's much easier to read a word that you've heard before than one that's brand-new, so vocabulary knowledge is one of the six early literacy skills kids need before they learn to read.